**Please note: 10Bet is no longer strongly endorsed by BettingPlanet.com. We strongly recommend playing at House Of Jack Casino or visiting our online casinos and sports betting pages to find another site accepting players from your country. IT may not be the biggest name in the online bookie business, but 10Bet is one of the best kept secrets in sports betting. This secure site is starting to really make a name for itself, now accepting punters from over 100 countries and offering one of the biggest ranges of sporting events going around, with more than 60,000 events available to place real money bets on every month. If you’re looking for a new bookmaker to check out, 10Bet definitely gets our tick of approval. One of the most appealing things about 10Bet is how user-friendly the site is, so even if you’re not familiar with online sports betting it won’t take you long to get the hang of it. Simply head to www.10bet.co.uk and sign into your account. You’ll then find the sport you want listed down the left hand side of the homepage. Click your desired sport, choose the league and follow the prompts to place your bet. Too easy! The welcome bonus at 10Bet is advertised at a tempting $200, but there are actually different bonus amounts available depending on your location. UK players can receive up to $200, Aussie players up to $350, American players up to $300 and so on, with different minimum deposits required for each (refer to the promotions page for details relevant to your country). To snap up the welcome bonus all you need to do is enter the promo code ‘FD100’ upon making your first deposit, then use that deposit to make a bet on an event with odds of at least 1.60. The deposit will then be automatically credited to your account within 24 hours. To withdraw the bonus there are certain wagering requirements you need to meet, set at six times the bonus amount. Only games with minimum odds of 1.60 will count towards these wagering requirements so be mindful of this when choosing your sporting events. Beyond the welcome bonus there are a bunch of other promotions offered by 10Bet, including things like two for one bonuses, money back offers and special event bonuses so keep an eye on your emails or reference the ‘promotions’ tab from the homepage to check what current promos are up for grabs. And that’s just the start of it. From time to time you can also find special events like government elections and Hollywood award ceremonies to bet on. The 10Bet mobile casino is browser-based, which means no downloads are required to access the sports betting software. All you need to do to be able to place bets on the go is have a smartphone or tablet that has access to the Internet, or if you’re reading this on your mobile device just click this link to head direct to the 10Bet mobile site. Being browser-based means that the site is accessible on a range of devices and operating systems, including iPhone, Samsung, Nokia, Windows Phone, BlackBerry, LG and a range of tablets. Most of these deposit options are fee free, but there may be some transaction costs on bank transfers depending on the terms and conditions set by your bank. Minimum withdrawals vary from between $10 and $50 based on your chosen payment method. How much can I bet with 10Bet? 10Bet allows some of the most lenient betting requirements we’ve seen on the Net, with wagers starting from as little as one cent. There’s no universal maximum bet that can be made, with limitations varying depending on the type of sport, the league and the type of bet you’re making. When you go to enter your bet you’ll see the exact betting limitations specified in the box where you place your wager. For some events, high rollers or those with a particularly good feeling about a game outcome can also choose to request making a wager higher than the specified maximum by entering the desired amount in the ‘by request’ tab. Once you’ve submitted your request you’ll either receive an approval or an alternative offer. How does 10Bet keep me safe? Like all the reputable online bookies we recommend at BettingPlanet.com, 10Bet uses SSL (Secure Socket Layer) digital security encryption to scramble all information so your personal or financial details can’t be intercepted by a third party. The site is also supported by all the right gambling industry bodies, receiving its gambling licensing from Curacao, which is one of the leading gambling jurisdictions so you can bet comfortably knowing you’re in good hands. If you can’t find the answer you’re looking for in 10Bet’s detailed FAQ section, your best bet is to hit up the customer service team on the 24 hour 7 day a week live chat line. There’s a friendly staff member on standby to help punters with any queries they may have, with an international help line available if you prefer to speak to someone over the phone. Alternatively, just fill out the online contact form in the ‘contact us’ section where you can choose to send your query directly to the relevant department. With 60,000 sporting events available to bet on every month, what’s not to love? Not only does 10Bet offer you pretty much everything you need from an online bookie all in the one safe place, the site is really easy to use, has some sweet promos going on and is backed by a supportive team. The addition of virtual sporting events, virtual horse racing and an online casino means there is so much variety, with the mobile site catering to both iOS and Android making 10Bet accessible to all punters. 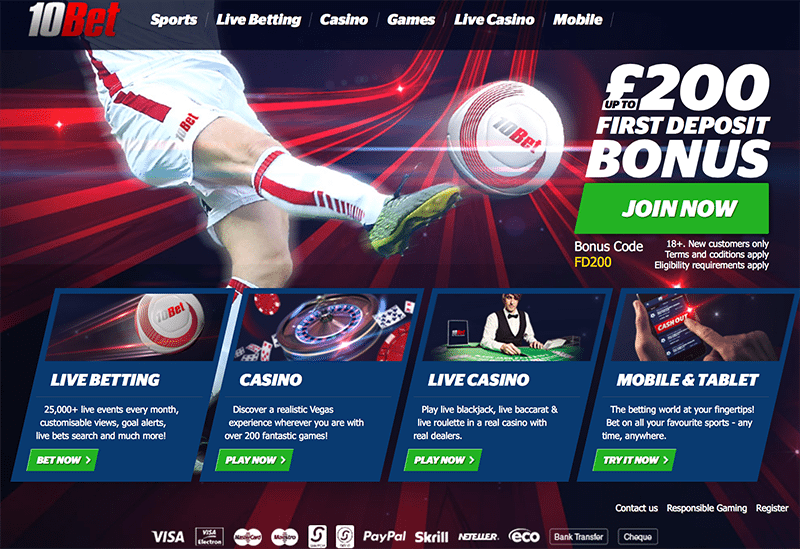 Sign on at www.10bet.co.uk and take advantage of the great specials and customer experience today!